Row 2: Turn, chain 3( counts as first double crochet) double crochet into the next space and in each space across row. 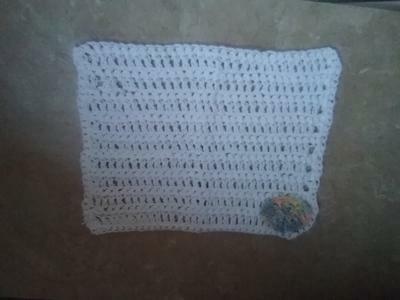 When dishcloth is large enough single crochet around edges. Chain 7 insert hook into 3rd chain from the hook and work 2 dc in each chain stitch across row. Chain 3 ( this counts as first double crochet) double crochet across row. Single crochet around edge of the project.